"The family wants to keep it very, very low-key and very, very private," the 66-year-old told Billboard magazine. "And you can imagine as soon as one or two or any of us were to show up, it would very quickly be degraded." Davy Jones, who died in Florida on 29 February, was the youngest member of the chart-topping '60s foursome. Born in Manchester in 1945, the former child actor was brought together with Dolenz, Michael Nesmith and Peter Tork to form a US alternative to the Beatles. The band enjoyed huge fame with their television show and a string of hits including I'm A Believer and Daydream Believer - on which Jones sang lead vocals. Plans are afoot to hold public memorials in New York and London, while a third event may take place in Los Angeles. Jones, said Dolenz, "had fans and family and associates on both coasts and two continents", adding it was "pretty early days... to be making too many plans". Though Dolenz said he had been "communicating" with Nesmith and Tork, there are no firm plans for them to perform at any of the proposed memorials. "I can see us getting together to do a memorial concert," he told Billboard. "But right now I can't imagine anything else happening." 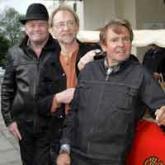 In 2011, Jones joined forces with Dolenz and Tork, 70, for a series of US gigs to mark the band's 45th anniversary. But the tour was abruptly curtailed last August, a cancellation Dolenz attributed to "business" reasons and "internal matters". The Monkees last toured as a quartet in 1997, after which guitarist Nesmith ruled out any further performances with the group.